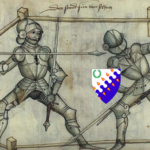 With the blessings of Their Excellencies Crispin and Gianna, Captain Sirius of Cleftlands is sponsoring an armored two person melee tournament. The tournament will be held on Wednesday, June 13th, 2018 at 8:00 PM in Euclid, OH at the regular Cleftlands meeting. The format will be a two person melee tournament any weapon styles, one member of Chivalry per team, in either round robin or elimination style depending on number of contestants.